The Battle of the Philippine Sea was fought on June 19-20, 1944, as part of the Pacific Theater of World War II (1939-1945). Having recovered from their earlier carrier losses at the Coral Sea, Midway, and the Solomons Campaign, the Japanese decided to return to the offensive in mid-1944. Initiating Operation A-Go, Admiral Soemu Toyoda, Commander-in-Chief of the Combined Fleet, committed the bulk of his surface forces to striking at the Allies. Concentrated in Vice Admiral Jisaburo Ozawa's First Mobile Fleet, this force was centered on nine carriers (5 fleet, 4 light) and five battleships. In mid-June with American forces attacking Saipan in the Marianas, Toyoda ordered Ozawa to strike. Steaming into the Philippine Sea, Ozawa counted on support from Vice Admiral Kakuji Kakuta's land-based planes in the Marianas which he hoped would destroy a third of the American carriers before his fleet arrived. Unknown to Ozawa, Kakuta's strength had been greatly reduced by Allied air attacks on June 11-12. Alerted to Ozawa's sailing by US submarines, Admiral Raymond Spruance, commander of the US 5th Fleet, had Vice Admiral Marc Mitscher's Task Force 58 formed near Saipan to meet the Japanese advance. Consisting of fifteen carriers in four groups and seven fast battleships, TF-58 was intended to deal with Ozawa, while also covering the landings on Saipan. Around midnight on June 18, Admiral Chester W. Nimitz, Commander-in-Chief of the US Pacific Fleet, alerted Spruance that Ozawa's main body had been located approximately 350 miles west-southwest of TF-58. Realizing that continuing to steam west could lead to a night encounter with the Japanese, Mitscher asked permission to move just far enough west to be able to launch an air strike at dawn. Concerned about being lured away from Saipan and opening the door for the Japanese slip around his flank, Spruance denied Mitscher's request stunning his subordinate and his aviators. Knowing that battle was imminent, TF-58 deployed with its battleships to the west to provide an anti-aircraft shield. Around 5:50 AM on June 19, an A6M Zero from Guam spotted TF-58 and radioed a report to Ozawa before being shot down. Operating on this information, Japanese aircraft began taking off from Guam. To meet this threat, a group of F6F Hellcat fighters was launched. Arriving over Guam, they became engaged in a large aerial battle which saw 35 Japanese aircraft shot down. Fighting for over an hour, the American planes were recalled when radar reports showed inbound Japanese aircraft. These were the first wave of aircraft from Ozawa's carrier which had launched around 8:30 AM. While the Japanese had been able to make good their losses in carriers and aircraft, their pilots were green and lacked the skill and experience of their American counterparts. Consisting of 69 aircraft, the first Japanese wave was met by 220 Hellcats approximately 55 miles from the carriers. Committing basic mistakes, the Japanese were knocked from the sky in large numbers with 41 of the 69 aircraft being shot down in less than 35 minutes. Their only success was a hit on the battleship USS South Dakota. At 11:07 AM, a second wave of Japanese aircraft appeared. Having launched shortly after the first, this group was larger and numbered 109 fighters, bombers, and torpedo bombers. Engaged 60 miles out, the Japanese lost around 70 aircraft before reaching TF-58. While they managed some near misses, they failed to score any hits. By the time the attacked ended, 97 Japanese aircraft had been downed. A third Japanese attack of 47 aircraft was met at 1:00 PM with seven aircraft being downed. The remainder either lost their bearings or failed to press their attacks. 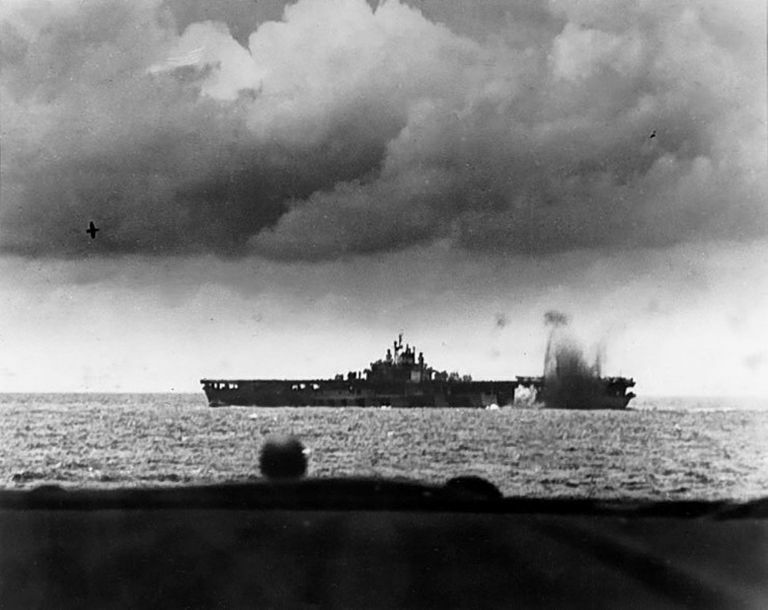 Ozawa's final attack launched around 11:30 AM and consisted of 82 aircraft. Arriving in the area, 49 failed to spot TF-58 and continued on to Guam. The rest attacked as planned, but sustained heavy losses and failed to inflict any damage on the American ships. Arriving over Guam, the first group was attacked by Hellcats as they attempted to land at Orote. During this engagement, 30 of the 42 were shot down. As Ozawa's aircraft were launching, his carriers were being stalked by American submarines. The first to strike was USS Albacore which fired a spread of torpedoes at the carrier Taiho. Ozawa's flagship, Taiho was hit by one which ruptured two aviation fuel tanks. A second attack came later in the day when USS Cavella struck the carrier Shokaku with four torpedoes. As Shokaku was dead in the water and sinking, a damage control error aboard Taiho led to a series of explosions which sank the ship. Recovering his aircraft, Spruance again held off turning west in an effort to protect Saipan. Making the turn at nightfall, his search aircraft spent most of June 20 trying to locate Ozawa's ships. Finally around 4:00 PM, a scout from USS Enterprise located the enemy. Making a daring decision, Mitscher launched an attack at extreme range and with only hours remaining before sunset. Reaching the Japanese fleet, the 550 American aircraft sank two oilers and the carrier Hiyo in exchange for twenty aircraft. In addition, hits were scored on the carriers Zuikaku, Junyo, and Chiyoda, as well as the battleship Haruna. Flying home in the darkness, the attackers began to run low on fuel and many were forced to ditch. To ease their return, Mitscher daringly ordered all of the lights in the fleet turned on despite the risk of alerting enemy submarines to their position. Landing over a two-hour span, the aircraft set down wherever was easiest with many landing on the wrong ship. Despite these efforts, around 80 aircraft were lost through ditching or crashes. His air arm effectively destroyed, Ozawa was ordered to withdraw that night by Toyoda. The Battle of the Philippine Sea cost Allied forces 123 aircraft while the Japanese lost three carriers, two oilers, and approximately 600 aircraft (around 400 carrier, 200 land-based). The devastation wrought by American pilots on June 19 led one to comment "Why, hell it was just like an old-time turkey shoot down home!” This led to the aerial fight earning the name "The Great Marianas Turkey Shoot." With the Japanese air arm crippled, their carriers only became useful as decoys and were deployed as such at the Battle of Leyte Gulf. While many criticized Spruance for not being aggressive enough, he was commended by his superiors for his performance.